Price doesn't always equate to quality, and plenty of LI restaurants prove that point with their creative approaches, authenticity and quality ingredients. Our food staff is always on the hunt for a top-notch meal that comes with a low price tag. Here are the latest Cheap Eats restaurants we've reviewed. 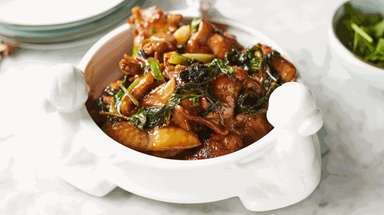 Kitchen Melody, Great Neck: Most of Long Island's Sichuan restaurants are raucous, bustling eateries; this one serves the regional cuisine in an elegant, subdued setting. Nahcho Papi, Patchogue: Toro Tapas & Tequila has been reborn as Nahcho Papi's, with a shift from Spanish-style small plates to Mexican and Peruvian specialties, plus CBD cocktails and plenty of margaritas. Ravello Ristorante, Huntington: This Italian and Italian-American eatery is good and often better. It's situated in the former site of Il Vecchio Forno, a pizza specialist in Huntington. Taino's Cafe & Lounge, Coram: Depending on the time of day (or night), this spot can feel like a restaurant, a busy bar or a disco -- but there's always plenty of mofongo, the hearty, garlicky Caribbean plantain dish. Kababjees, Hicksville: This Pakistani meat specialist also scores with spectacular potato dishes. Xiao Si Chuan, Setauket: This Chinese restaurant has hard-to-find hot pots on each table. F.A.N. Authentic Chinese Cuisine, Deer Park: This spiffy and friendly eatery is a great place to enjoy the splendor of Sichuan cuisine. Streats Food + Drink, Cedarhurst: Streats is the casual, inexpensive offspring of three-star Doma Land + Sea and Italian-New American Cork & Slice, both also situated in Cedarhurst. Avo Taco, New Hyde Park: Avocados are one of the main attractions at this bright and shiny nouveau taqueria and bar. El Encanto, Mineola: This Peruvian restaurant is on its way to being professional, but consistently charming. Rice Thai, North Patchogue: This tiny restaurant seats 16 diners in a storefront space, but the cooking is big-time. Cheng Du, Franklin Square: This Chinese restaurant aims to please both authentic Sichuan and American-Chinese palates. Stirling Sake, Greenport: This Japanese restaurant stands out with a creative menu and extensive sake selection. Lazzat, Wantagh: This family-run restaurant takes a warm, homestyle approach to Indian and Pakistani cuisine. Avli the Little Greek Kitchen, North Bellmore: This Greek takeout spot, the third in a growing chain, conjures bold flavors in tight quarters. NoaMar Market, Babylon: Explore the marvels of Spanish cuisine at this charming, all-day cafe, tapas bar and market. El Matador Restaurant, East Patchogue: Ever since chef Juan Alvarado moved from El Salvador to the U.S. at age 16, he has worked in restaurant, turning out cuisine ranging from Salvadoran and Colombian to Spanish, Italian and Mexican. His first restaurant, El Matador, brings together all of those influences, as well as family: Alvarado's daughters, Emily and Melanie Alvarado, run the front of the house. The Gourmet Whaler, Cold Spring Harbor: This Main Street eatery is a refreshing spot for breakfast, lunch and dinner. Pomodorino Rosso, Valley Stream: This boisterous new Italian eatery serves inventive dishes and has a veteran pizza maker on staff. Mamoun's Falafel, Syosset: This venerated falafel chain, which started in Greenwich Village in the 1960s, has opened its first location on Long Island. North Tavern, Wading River: This new eatery brings a something-for-everyone menu and casual style to Long Island at the former address of Fiesta Mexicana and Amarelle. Virgola Oysters & Wine Bar, Patchogue: This oyster-and-Italian wine bar may jumpstart the ritual of aperitivo in Patchogue's ever-growing foodscape. Rothchilds Coffee & Kitchen, Great Neck: This bright, refreshing breakfast and lunch spot mixes Middle Eastern and American. Deccan Spice, Deer Park: This South Indian restaurant rewards repeat visits. Mattitaco, Mattituck: A North Fork food truck owner and CIA-trained chef combined forces for this cozy, colorful spot, where cheeseburger tacos share the menu with dirty fries and grilled Mexican street corn. Barn Door 49, Bay Shore: When 18-year-old Milk & Sugar Cafe closed last year, its owners took the place down to the studs and resurrected their business as Barn Door 49 -- a gastropub with a farmhouse vibe, sustainably sourced meat and seafood, and excellent craft cocktails and beers. Bunker Hill American Taproom, Wantagh: In spring 2018, a longtime watering hole was transformed into this gastropub with an enviable beer list and plenty of inventive bar snacks. Dang BBQ, Islip: This exuberant eatery serves classic barbecue with over-the-top variations. MB Ramen, Huntington: Superstar chef Marc Bynum showcases an East meets American South twist on ramen with mixed results. Hatch, Huntington: This brunch place is a cheerful but loud affair with great cocktails, large portions and a buzzy vibe. Mithaas, Hicksville: This bright Indian-food cafe next to Apna Bazar has an encyclopedic menu that cinches together foods from across India. Start with a dosa and end with a creamy mango lassi for dessert. Broadway Market, Rocky Point: This handsome, airy new spot brings comfort food to a new level. Irving's World Famous Pastrami, Woodbury: This new pastrami eatery comes with a family history and unusual pastrami dishes. The Inkan, Garden City Park: This charming new restaurant-bar brings a taste of Peru to Long Island. Addy's BBQ, Elmont: This barbecue joint puts an American twist on halal cooking for young people who want a well-made, diet-approved cheeseburger. Petra Grill, Carle Place: Culinary pride and passion distinguish this new Middle Eastern restaurant. 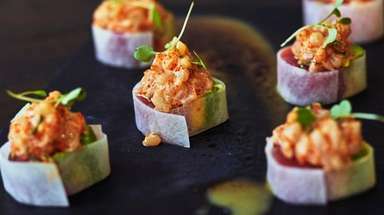 Sam's Sushi Bistro, Farmingville: At this new sushi spot, there's plenty of raw fish but it's the Chinese-influenced dishes that impress. Bell's Kitchen & Smokehouse, Franklin Square: Bell's offers a Nassau born chef's tour of southern food, including fried alligator and a slow-smoked hulking beef rib. Saigon Casa, Port Jefferson Station: At Suffolk County's only Vietnamese restaurant, adventurous eaters can indulge unfamiliar flavors --- plus signature dishes like pho and banh mi. Coastal Kitchen & Daiquiri Bar, Bay Shore: Downtown Bay Shore has a new destination for food and drink from the owners of nearby Verde Kitchen & Cocktails. Sempre Fame Gourmet Grill & BBQ Catering, Floral Park: This neighborhood eatery serves top-flight barbecue and over-the-top sandwiches. 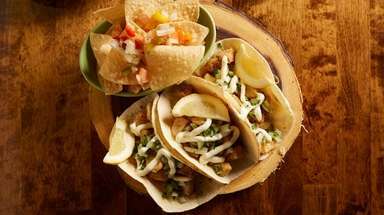 Barito Tacos & Cocktails, Port Jefferson: Hidden on top of a Starbucks in Port Jefferson Village, Barito Tacos & Cocktails sets itself apart with unusual offerings in the American Mexican genre. 365 Noodle Bar and Grill, Hicksville: This authentic Chinese restaurant specializes in the casual eats of Beijing. Talluci's Pizzeria, Farmingdale: This chic pizzeria impresses with pies, pasta and more. La Bonita Tacos & Tequila, Coram: La Bonita Tacos & Tequila is a cheerful, low-key oasis for Mexican comfort and margaritas. Spicy Home Tasty, Commack: This stellar new Chinese restaurant highlights the sophisticated cuisine of Sichuan. Simply Thai, Copiague: Simply Thai impresses with authentic cooking and warm service. Vienna of Roslyn, Roslyn: Nightclubs are rarely, if ever, known for their food -- but this eatery named after the popular Billy Joel tune is not dialing it in. Elijah Churchill's All-American Barbecue House, Northport: At the revamped Elijah Churchill's, the kitchen won't win any barbecue competitions, but it's hard not to have a lively evening when a local band is in the house and the bar is well-stocked. Yum Yum Dumplings, Centereach: This Chinese dumpling shop offers soulful fare at an incredible price. The Shed, Huntington: The Shed may not call itself a luncheonette, but it has all the hallmarks of a modern one, including a lively active bar. Everest Himalayan Cuisine, Bellmore: Long Island's first Nepali restaurant offers peak hospitality. Pita House, Medford: Pita House offers diners Turkish food 101. The Tavern by George Martin, Rockville Centre: This gastropub resurrection of a previous George Martin restaurant serves up hulking portions of cosseting food in a long, loud, richly toned room. La Vicharra Grill, Glen Cove: This spot brings the singular cuisine of Peru to Long Island. The Local, Babylon: At first glance, The Local may look like a sports bar -- but this airy spot is turning out some of the best sandwiches on the South Shore, alongside an impressive tap list of mostly European beers. DJ's Clam Shack, Wantagh: North meets South at DJ's Clam Shack, the Wantagh offshoot of the Key West original. Mamey Taquería, Babylon: Babylon's newest taqueria is a tiny, bright spot far from the village's main drag -- and its carnitas tacos are worth seeking out. Kebab House, Hicksville: At this Afghan restaurant, the food hits that sweet spot between familiar and exotic. Robke's Country Inn, Northport: Robke's Country Inn has been serving up Italian classics for decades, but a new audience is discovering its huge portions, heavy pours and rollicking vibe. Ben's Crab, Oceanside: An Indonesian immigrant, who fell in love with Lousiana style seafood in a bag, is sharing it with Long Islanders. Grain House, Uniondale: This student-friendly authentic Chinese restaurant has set up shop in the old BurgerFi in the heart of Hofstra. Umberto's, Manhasset: The seventh link in this Long Island pizza chain tweaks the formula for success with a chic new look and menu updates. Cafe Bethel, Freeport: Cafe Bethel features a "goliath" taco that immigrated from a small mountain town in the Honduras to this Central American restaurant in Freeport. Basil Cafe & Restaurant, St. James: This resurrection of the beloved Zar Cafe retains the same charming ambience, with dishes that exude complex layers of spice. Choopan Grill, Selden: Afghan family recipes passed down from generation to generation are the highlight at this eatery. Kabayan Grill, East Meadow: Housed in an former Taco Bell, the bright, no-frills Kabayan Grill joins the handful of Filipino eateries on Long Island offering staples such as lechon, sisig, lumpia and siningang. Swell Taco, Patchogue: It's all about the surf-centric vibe at the second location of Swell Taco, an offshoot of the Babylon eatery. Olde Trading Post Tavern, New Hyde Park: This new neighborhood tavern specializes in old-fashioned hospitality. Henley's Village Tavern, Brightwaters: This new gastropub in the heart of quaint Brightwaters offers craft cocktails, clever twists on bar food and "scratch kitchen" dishes that take advantage of seasonal ingredients and the chef's creative whims. Margarita's Cafe, Williston Park: The sixth link in a local Mexican mini-chain, Margarita's Cafe in Williston Park is a better place to drink than eat. Copper Pot Chicken Co., Rockville Centre: A fried chicken dish that originated as special on a steakhouse menu, has been spun off into its own restaurant in Rockville Centre. Copper Pot Chicken Co. features birds that have been bathed in a 24-hour brine, crusted in a mix that include matzo meal and then fried twice so the chicken is extra crisp. The Brixton, Babylon: At this stand-out Babylon gastropub, the food, drinks and design are all raising the bar. 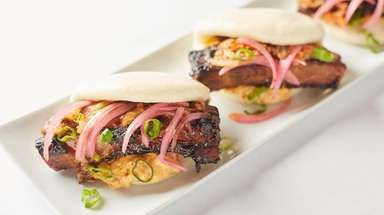 New Fu Run, Great Neck: Serving the gutsy cuisine of Northeast China in an elegant, comfortable setting, Great Neck's New Fu Run rewards the adventurous diner. Crabtree's New York & Main, Huntington: Perched above downtown Huntington's main crossroads, Crabtree's New York & Main is a late-night spot with a wide-ranging drinks menu and a caloric roster of gastropub fare. Clay Oven, Hauppauge: At Clay Oven, Lubna Habibi is pushing the limits of authentic South Asian food that go beyond what we've come to define as such fare with dishes like tandoori chicken wings, pakoras that play on cheese sticks and a lamb meatball curry that falls in the scotch egg family. With most dishes on the menu $10 or less, it's easy to venture outside your comfort zone and leave with a little extra for tomorrow. Ramen Kyoto, Bethpage: Ramen Kyoto breaks new ground as Nassau's first ramen specialist, but pulls its punches with timid noodle soups. Wahlburgers, Port Jefferson Station: This burger joint at the heart of a reality TV show is not the same in real life. Wildfeast, Long Beach: This cool, contemporary newcomer rocks Long Beach's main drag. JR El Rodeo, East Moriches: This barebones Mexican storefront with eight tables offers authentic made-to-order classics like burritos and tacos. St. James Public House, St. James: This sleek roadhouse with a lively bar offers beer- and wine-friendly soups, salads, burgers and skillet dinners. Yiasou Yeeros, Plainview: Cooking with care and quality ingredients, this modest Greek takeout spot far outpaces the average gyro joint. Main Road Biscuit Co., Jamesport: With ingredients from East End farms and coffee from nearby North Fork Coffee Roasters, this is the diner locavores have been waiting for. 5 de Mayo, Westbury: 5 De Mayo is a modest strip mall restaurant selling margaritas and generous portions of Tex-Mex dishes. It's especially hopping on mariachi nights. China Station, Stony Brook: Huge portions of gutsy Northern Chinese chow define China Station, a Stony Brook newcomer that is already a haven for hungry university students. Saravanaa Bhavan, Hicksville: The first Long Island outpost of this Indian chain serves a vast array of exotic vegetarian dishes. Naples Street Food, Franklin Square: This modest storefront offers great pizzas warmed up by a wood-fired oven and Neapolitan hospitality. The Cuban, Garden City: Island style meets Garden City in this huge space, where diners sip mojitos and pina coladas and choose among a huge selection of Latin American dishes. Watch Season 2 of Feed Me TV Feed Me TV: Watch season 1 nowThis is Feed Me TV, the show that takes you inside Long Island’s food scene, LI's top 100 restaurants of 2018We tested (and tasted) the local restaurant scene to bring you this. 50 LI spots for fine diningNewsday's latest fine dining reviews.